LockRite's Perry Barr Locksmith is an expert in lock repairs and replacements for both commercial and domestic clients. Our focus on customer service and value for money makes us the number one choice for major companies and home owners alike. We cover Perry Barr and the surrounding areas and are on-call 24 hours a day for all types of locksmith work, from burglary repairs, to lock-outs. We aim to get to you within 30 minutes, and we're available 24 hours a day. Call 0121 726 6297 for a free, no obligation quote or click here to make an online enquiry. A local, Father and Daughter family business, Alan and Jenny have been trading for almost 5 years. Prior to that, Alan had been working in the lock industry for 17 years. 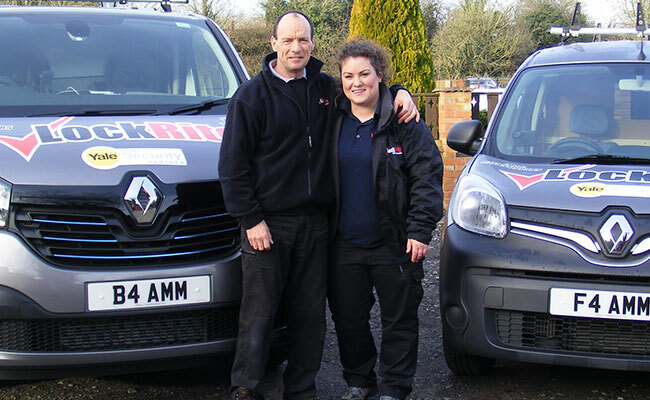 Your LockRite Locksmiths, Alan and Jenny offer local and mobile locksmithing services in your area, 24 hours a day. We are experts in lock repairs and replacements for both domestic and commercial clients. We gain entry using the latest non destructive entry techniques and locksmithing equipment. We pride ourselves in being specialists in UPVC mult-point door and window locks. Including fault findings, adjustments, realignments and repairs. We carry a large selection of parts on our vans, from leading brands including Yale, ERA and Union. Which means you can expect that we complete the job in just one visit. 12 months warranty is guaranteed on all parts supplied and fitted. We work on a large variety of doors. Including, UPVC, wooden, composite, garage doors, conservatries, sliding patio doors, aluminium andcommercial doors. We also specialise in window repairs and double glazed unit replacements. We supply, fit, change and repair a wide variety of locks. Including: Anti-Snap Locks, British Standard insurance approved Mortice locks up to 3621, Euro and Rim cylinders and much more. Our mobile key cutting machine means we can cut as many keys on site as you require. We are YALE security accredited installer for their Smart Home range, including keyless and key free locks. And their wireless alarm systems. In addition to this we carry out burglar repair work, including boarding up. Making your home or premises is secure, without leaving any damage to your exisiting door or window frame. We offer free quotes, no obligation. There is no call-out fee and no hidden charges. So, whether you need your locks changing, been burgled, experiencing door or window closing problems, locked out or even locked in, contact us today for your friendly father and daughter professional locksmiths, Alan and Jenny. We can usually get to you within just 30-60 minutes. Our aim is to make you feel safe and secure. Our professional locksmiths carry a wide range of replacement locks and cylinders which means we can usually effect repairs and replacements in one visit, saving you time and money. We have been trained to gain entry using the latest non-destructive techniques & equipment. So, if you've misplaced your keys or find you're locked out, then we can get you back in without unnecessary damage to your property. Also, because we're local to you, we can usually get there within 30 - 60 minutes. If your house has been broken into, more often than not there will be damage where the burglar has forced entry. In these cases there is an urgent need to make the premises secure. Is your home secure? If you're in any doubt at all, why not book a security survey? Simply call 0121 726 6297 and we'll be happy to help! If you've misplaced your keys or find you're locked out, then we can get you back in without unnecessary damage to your property. Also, because we're local to you, we can usually get there within 30 - 60 minutes. Specialists in uPVC multi-point door locks and mechanisms, we carry all the necessary spares to repair over 95% of common uPVC door & lock problems on the spot, within an hour! When it comes to your security, quality speaks volumes. We are able to offer British Standard, insurance approved mechanisms and all parts come with a 12 month manufacturers warranty as standard. LockRite vans are equipped with key-cutting equipment and a wide range of common household and commercial key blanks. So, extra keys for the office or family can be supplied on the spot at a fraction of the usual cost. We provide a full range of commercial services, from simple lock replacement to master key and access systems. We also provide reliable locksmith attendance for bailiffs and warrant work. 24 Hour service is subject to locksmith availability. When it comes to something as sensitive as securing your property you need to be 100% sure you can trust the person doing the job. We are a national company with a UK wide network of local locksmiths who can be with you within 30-60 minutes (in most cases). All LockRite locksmiths are fully trained in the latest non destructive entry techniques and are CRB (Criminal Records Bureau) checked so you know when you book a LockRite locksmith you are booking a trustworthy professional. All work is 100% guaranteed with 12 months guarantee on all parts and 90 days guarantee on all workmanship. Customer services can be contacted Mon - Sun, 8am - 6pm on 0800 0612 677 if you have any queries or concerns about the service you have received from one of our locksmiths.. Call us now for a competitive quote and peace of mind you are dealing with a company that cares about your security. All our locksmiths are trained at our modern, in-house, City & Guilds training facility to gain entry using the latest non-destructive techniques & equipment. So, if you've misplaced your keys or find you're locked out, then we can get you back in without unnecessary damageÂ to your property. Also, because we're local to you, we can usually get there within 30 - 60 minutes. LockRite can be on the scene within 20-40 minutes (in a majority of cases) to make the necessary repairs and change locks if needed. Our locksmiths carry a wide range of replacement locks and cylinders which means we can usually effect repairs and replacements in one visit, saving you time and money. Is your home secure? If you're in any doubt at all, why not book a security survey? Simply call 0800 0612 677 and we'll be happy to help! and our customer service team is available 24/7 to discuss any queries on 0800 0612 677. All our locksmiths are self employed individuals working within your locality. By choosing LockRite you are choosing to support local business. 1.1 Contract means the contract for the provision of the Services. Customer means the person or business as set out on the Job Sheet whose request for the Services is accepted by LockRite Locksmiths Ltd. Price means the total charge calculated in accordance with the rates or charges on the Job Sheet, or if no charge has been quoted then a reasonable charge, which excludes VAT where applicable unless otherwise stated in writing. Deposit means any deposit requested and/or taken for the provision of Services and/or Additional Work as set out on a Job Sheet. Additional Work means any additional Services that are detailed in a Job Sheet that are additionally required to be carried or a subsequent supply of Services at a later date. Services means the provision of services, along with any LockRite Locksmiths Ltd supplied Goods, as set out on the Job Sheet for the Price agreed. Goods means the physical goods, parts or materials supplied to the Customer for the Price agreed. Order means the details as set out on the Job Sheet. Completion and/or Completed means the time and/or date on which LockRite Locksmiths Ltd deems the provision of the Services completed. Terms means these terms and conditions for the supply of Services. 1.2 The headings in these Conditions are for convenience only and shall not affect their interpretation. 1.3 The plural shall also mean the singular and the singular shall also mean the plural. 2.1Payment is due in full on Completion unless prior written agreement to the contrary has been made by LockRite Locksmiths Ltd in writing. Any overdue payments are strictly subject to clause 2.6. 2.2 The Price due for the Services is as shown on the Order. LockRite Locksmiths Ltd reserves the right to apply a surcharge to the Price for any payment by credit or debit card, however any such surcharge payable will be notified to the Customer, by LockRite Locksmiths Ltd, before taking payment by card. 2.5 In some circumstances the Customer may be asked to pay a Deposit. If the Deposit is subsequently not made within the required time, LockRite Locksmiths Ltd reserves the right to cancel the Order. If the balance of the Price is not paid, or the Customer cancels the Contract otherwise than as permitted LockRite Locksmiths Ltd shall be entitled to retain the Deposit. 2.6 If payment is not made in accordance with these Terms, LockRite Locksmiths Ltd, without prejudice to any rights of the Customer, understands and reserves the right to claim interest and compensation for debt recovery costs under the late payment legislation if LockRite Locksmiths Ltd is not paid according to the agreed Terms and the Customer shall additionally be liable to pay to LockRite Locksmiths Ltd all or any costs incurred in collection of outstanding moneys including Solicitor's fees and disbursements. 2.7 If LockRite Locksmiths Ltd has agreed with the Customer that the Price will be settled by a third party and LockRite Locksmiths Ltd does not receive payment in accordance with these Terms, the Customer shall remain liable at all times for payment of the Price and LockRite Locksmiths Ltd reserves the right to request immediate payment of the Price from the Customer. Any responsibility for recovering the Price from the third party will then be the sole responsibility of the Customer. 2.8 At any time before or during the supply of the Services as soon as it becomes aware at the same LockRite Locksmiths Ltd shall give written notice to the Customer of any increase in the cost to LockRite Locksmiths Ltd necessitating an increase in the Price which is a result of any problems onsite which could not reasonably have been foreseen or discovered at the time the Contract was termed or any change in specification of the Services which are requested by the Customer or as a result of any delay caused by any instructions of the Customer or failure of the Customer to give LockRite Locksmiths Ltd adequate information or instructions. 2.9 If the Customer fails to do so, or provides LockRite Locksmiths Ltd with incomplete, incorrect or inaccurate information or instructions. LockRite Locksmiths Ltd reserves the right to cancel the Contract by giving written notice to the Customer, or to make an additional charge of a reasonable sum to cover any Additional Work that is required. 2.10 No contract exists between the Customer and LockRite Locksmiths Ltd for the supply of the Services until LockRite Locksmiths Ltd has received and accepted the Customers signed Order. Once LockRite Locksmiths Ltd does there is a binding legal contract between LockRite Locksmiths Ltd and the Customer. 2.11.1 To exercise the right of cancellation, the Customer must give written notice to LockRite Locksmiths Ltd by delivering, or sending (including by electronic mail) to the contact details provided on the Order before the end of the 7 day cooling-off period. The Job Sheet has a cancellation form that can be used however the Customer does not have to use this form. 2.11.2 If the Customer has given written agreement to receive the Services within the 7 day cooling-off period then the Customer will still have to pay for the Services already provided. 3.1 Details of the Services are set out on the Order. 3.2 LockRite Locksmiths Ltd shall use its best endeavours to provide the Services to a standard generally accepted within the trade or industry to be of acceptable quality. LockRite Locksmiths Ltd's liability in respect of any defect or sub-standard workmanship shall be limited to making good by repair any Services that are shown to LockRite Locksmiths Ltd's reasonable satisfaction to be defective or sub-standard or to refund the charge made by LockRite Locksmiths Ltd for the workmanship deemed to be sub-standard or defective. The sole decision as to whether the remedy shall be repair or refund will rest with LockRite Locksmiths Ltd.
3.3 The Customer will take all reasonable steps to comply with relevant health and safety legislation and other rules and regulations where the Services are to be performed at the Customer's premises. 3.4 The Customer will inform LockRite Locksmiths Ltd, in advance and/or at the initial time of contacting LockRite Locksmiths Ltd, of any potential hazards or precautions needed at the premises where the Services are to be performed. LockRite Locksmiths Ltd reserves the right to cancel the Order if, at its sole discretion, assesses at any time that there is a potential health and safety risk and this cannot be reasonably rectified or guarded against without additional time or cost to LockRite Locksmiths Ltd. If this has not been previously notified to LockRite Locksmiths Ltd by the Customer then the Customer shall be liable for any costs incurred by LockRite Locksmiths Ltd up to the time of frustration. 3.5 The Customer will obtain in advance permission for LockRite Locksmiths Ltd to enter any premises, work on or over party walls, fences, boundaries and suchlike belonging to third parties, where appropriate, and the Customer shall indemnify LockRite Locksmiths Ltd against any claims of whatsoever nature made by third parties arising out of LockRite Locksmiths Ltd's presence on or over their property except where such claims result directly from LockRite Locksmiths Ltd's negligence. The Customer shall be liable to LockRite Locksmiths Ltd for all loss or damage whether direct, indirect or consequentially suffered by us as a result of failure or delay by the Customer regarding the obligations referred to above. 3.6 LockRite Locksmiths Ltd may make any changes to the provision of the Services required to conform with safety requirements and / or legislation. 3.7.2 are to be provided in response to a water leak stop request from the Customer then LockRite Locksmiths Ltd shall not be liable to the Customer for any failure to stop any such leak, or for any damage caused by such a leak, or residual water that may have entered any hidden part of the structure, either before or after Completion. 3.8 LockRite Locksmiths Ltd may perform the Services in stages with each stage separately invoiced and paid for under the Contract. 3.9 The Customer acknowledges that painting and otherwise treating exposed or new surfaces resulting from the provision of the Services, including but not limited to any external timber parts is not part the Services, unless LockRite Locksmiths Ltd has agreed in writing to the contrary. 3.10 The Services by their very nature are often carried out in emergency, awkward, dirty or wet circumstances and in placing an order with LockRite Locksmiths Ltd for Services the Customer acknowledges, accepts the risk and agrees to not hold LockRite Locksmiths Ltd liable for any marking or damage that may occur in and around the area that the Services are to be performed as a direct consequence of the Services being supplied. 3.11 The Customer shall be responsible for the removal of spoil, waste, packaging or similar unless agreed by LockRite Locksmiths Ltd in writing. 3.12 LockRite Locksmiths Ltd shall have no liability to the Customer for any loss, damage, costs, expenses or other claims for compensation arising from any information or instructions supplied by the Customer which is, are or turn out to be incomplete, incorrect or inaccurate. 3.13 LockRite Locksmiths Ltd shall not be liable to the Customer for any unforeseeable loss or damages arising from the provision or non-provision of the Services, including loss of profit or consequential loss or damage. 3.14 LockRite Locksmiths Ltd shall not be responsible to the Customer for any delay in performance or non-performance due to Force Majeure (including but limited to act of God, war, terrorism, power failure or other cause beyond the reasonable control of LockRite Locksmiths Ltd).,LockRite Locksmiths Ltd will make all reasonable attempts to promptly, upon the occurrence of any such causes, inform the Customer, stating that such cause has delayed or prevented its performance hereunder and thereafter shall take action within its power to comply with the Contract as fully and promptly as possible. 3.15 LockRite Locksmiths Ltd's liability in respect of any defect in the Services or shall be limited to making good by repair any Services that is shown to LockRite Locksmiths Ltd's reasonable satisfaction to be defective or sub-standard or to refund the charge made by LockRite Locksmiths Ltd for the part of the Services deemed to be sub-standard or defective. The sole decision as to whether the remedy shall be repair or refund will rest with LockRite Locksmiths Ltd.
3.16 LockRite Locksmiths Ltd will attempt to keep to any stated or arranged commencement, completion, appointment, delivery, installation or other such date or time given, but will not be liable for any failure to do so or for the consequences of any delay. Any time or date given by LockRite Locksmiths Ltd shall be an estimate only and shall not be the essence of the Contract. 3.17 LockRite Locksmiths Ltd may perform any of its obligations or exercise any of its rights hereunder itself or through any other party (including its employees, agents or subcontractors) approved by it provided that any act or omission by such party shall be deemed to be LockRite Locksmiths Ltd's act or omission. 3.18 The Customer agrees to fully and effectively indemnify LockRite Locksmiths Ltd, its employees, agents or subcontractors against all claims losses costs, including without limitation reasonable professionals' costs, and expenses made against LockRite Locksmiths Ltd arising from any loss injury or damage suffered by the Customer or a third party arising out of the Customer's breach of any legal obligations, clause(s) of these Terms, the rights of any third parties and/or the Customer's use or re-sale of the Services. 4.1 The Guarantee is conditional on the Customer fully complying with it's obligations under the Terms of the Contract. 4.2.1 The Customer shall inspect the Services as far as reasonably possible immediately on Completion or as soon as reasonably possible after. LockRite Locksmiths Ltd will endeavour to make any defects good immediately but where LockRite Locksmiths Ltd is unable to immediately make good then a return visit shall be arranged by LockRite Locksmiths Ltd as soon as reasonably possible. The sole decision as to whether the work is made good immediately or on a return visit shall rest with LockRite Locksmiths Ltd. Any defects that were not immediately apparent or where inspection of the Services was not possible shall be notified to LockRite Locksmiths Ltd in writing within 7 (seven) days of the Completion. If such notice is not given by the Customer then LockRite Locksmiths Ltd will conclusively presume that the Services are in accordance with the Contract and the Customer shall be deemed to have accepted the Services. 4.2.2 The guarantee shall not apply to any adjustment or otherwise of, including but not limited to doors, hinges, keeps or on repairs to existing parts. Additionally LockRite Locksmiths Ltd will not accept liability for old and/or faulty third party equipment and any associated faults or otherwise, including but not limited to warping and non-aligned doors or other reasons outside its direct control. 4.2.3 After the expiry of the initial guarantee period in clause 4.2, LockRite Locksmiths Ltd additionally extends the Goods guarantee to 12 months from Completion or such other guarantee LockRite Locksmiths Ltd may receive from the manufacturer of the Goods. This extended guarantee on the Goods does not include labour and further charges will apply if the Customer wants LockRite Locksmiths Ltd to provide labour in these circumstances. Goods are supplied with a guarantee that they are fit for the purpose for which they are manufactured to the reasonable satisfaction of the Customer provided they are used and maintained as instructed or recommended by LockRite Locksmiths Ltd and/or Manufacturer. LockRite Locksmiths Ltd's liability in respect of any defect in the Goods supplied or incorporated in the Services provided by it shall be limited to making good by repair or exchange or refund of the original Price of the Goods, at LockRite Locksmiths Ltd's sole discretion, any Goods which are shown to LockRite Locksmiths Ltd's reasonable satisfaction to be defective under proper use and maintenance within any guarantee period: provided that such defective goods are promptly returned to LockRite Locksmiths Ltd's address carriage paid, however LockRite Locksmiths Ltd may at its own option repair goods on the Customer's premises. Return carriage to the Customer on Goods repaired or exchanged under this Clause will be borne by LockRite Locksmiths Ltd. In the event of LockRite Locksmiths Ltd dispatching replacement Goods at the urgent request of the Customer prior to receiving the returned Goods, then LockRite Locksmiths Ltd reserves the right to make a full charge for such Goods and for carriage and handling if the returned goods are shown not to be defective in accordance with the provisions hereof. 4.3.3 if the Customer fails to comply with clause 4.2.1 above. 5.1 Risk of damage to, or loss of the Goods shall pass to the Customer upon the earlier of delivery of the Goods to the Customer's premises or installation of the Goods in accordance with the Order. 5.2 Notwithstanding delivery or notification of availability for collection and the passing of risk in the Goods or any provision of these Terms, property in the Goods shall not pass to the Customer until LockRite Locksmiths Ltd has received full payment of the Price of all Services for which payment is then due. 5.3 Until such time as the property in the Goods passes to the Customer, the Customer shall hold the Goods as LockRite Locksmiths Ltd's fiduciary agent and/or bailee and keep the Goods separate from those belonging to others, properly stored, protected, insured and clearly marked as LockRite Locksmiths Ltd's property. 5.4 Until property passes to the Customer LockRite Locksmiths Ltd shall be entitled to require the Customer to deliver the Goods to it and on failure to do so, within 7 days of such notice of re-delivery from LockRite Locksmiths Ltd, the Customer irrevocably authorises LockRite Locksmiths Ltd's representatives to enter the premises on which the Goods are situated and remove the Goods at the Customer's expense. 5.5 The Customer shall not be entitled to charge by way of security, or similar, for any indebtedness any of the Goods which remain LockRite Locksmiths Ltd's property but if the Customer does so all monies owing to LockRite Locksmiths Ltd by the Customer shall, without prejudice to any other right or remedy of LockRite Locksmiths Ltd's, forthwith become due and payable. 6.1.6 LockRite Locksmiths Ltd reasonably believes that any of these events mentioned above is about to occur and notifies the Customer in writing of such. 7.1 These Terms together with the Order apply to the supply of the Services by LockRite Locksmiths Ltd. Any changes or additions to these Terms or the Order must be agreed in writing between the Customer and LockRite Locksmiths Ltd once the Order has been accepted by LockRite Locksmiths Ltd.
7.2 LockRite Locksmiths Ltd may change these Terms without notice to the Customer in relation to the provision of future Services and it is the Customer's sole responsibility to check the current Terms before ordering future Services. 7.3 LockRite Locksmiths Ltd shall supply the Services on these Terms to the exclusion of any other terms and conditions and any stipulations or conditions in a Customer's order which conflicts with or in any way negates these Terms shall be deemed to be inapplicable to the Contract unless expressly agreed to by LockRite Locksmiths Ltd in writing. 7.4 It is the sole responsibility of the Customer to ensure that the terms of the Customer's requirements, including but not limited to the relevant details in the Order, are complete and accurate. 7.5 LockRite Locksmiths Ltd will use the Customer's personal data for the purpose in relation to which the Customer has provided it. LockRite Locksmiths Ltd may however need to disclose personal data to a third party so that they can provide the Services requested, or to monitor the quality of the Services provided, or to fulfill a Subject Access Request, or to keep LockRite Locksmiths Ltd informed of offers or services LockRite Locksmiths Ltd believes may be of interest (unless the Customer has notified us otherwise). LockRite Locksmiths Ltd may additionally need to disclose information where there is a legitimate reason for disclosure (such as a court order) but LockRite Locksmiths Ltd will ensure that it always complies with any Data Protection or Privacy legislation in force. Any information about the Customer that LockRite Locksmiths Ltd may pass to a third party will be on the understanding that it is held securely by that party, in accordance with any Data Protection or Privacy legislation in force. 7.6 No failure of LockRite Locksmiths Ltd to exercise any power given to it or to insist upon the Customers strict compliance with any Terms of the Contract shall constitute any waiver of LockRite Locksmiths Ltd's rights. 7.7 It any provision of these Terms is held by any competent authority to be invalid and/or unenforceable in whole in part the validity of the other provisions of the Terms and the remainder of the Terms in question shall not be affected. 7.8 The Contract is between LockRite Locksmiths Ltd and the Customer and may be assigned by LockRite Locksmiths Ltd without the consent of or the need to give any notice to the Customer. The Customer shall not assign or otherwise transfer any rights, including without limitation benefits, or obligations that it may have under the Contract to any third party without LockRite Locksmiths Ltd's prior written consent. 7.9 Except as otherwise provided nothing in this Contract creates any right enforceable by any person or business not a party to it. 7.10 Any notice given hereunder must be given in writing, including by electronic mail and delivered to the residence, address or principle place of business of the party to whom it is addressed. The term 'The RiteGroup' or 'us' or 'we' refers to Lockrite Locksmiths Ltd, the owner of the RiteGroup websites whose registered office is 8 Christow Road, Exeter, EX2 8QP. Our company registration number is 06345788, England. The term 'you' refers to the user or viewer of the RiteGroup websites. The content of the pages of the RiteGroup websites are for your general information and use only. It is subject to change without notice. Neither we nor any third parties provide any warranty or guarantee as to the accuracy, timeliness, performance, completeness or suitability of the information and materials found or offered on the RiteGroup websites for any particular purpose. You acknowledge that such information and materials may contain inaccuracies or errors and we expressly exclude liability for any such inaccuracies or errors to the fullest extent permitted by law. Your use of any information or materials on the RiteGroup websites is entirely at your own risk, for which we shall not be liable. It shall be your own responsibility to ensure that any products, services or information available through the RiteGroup websites meet your specific requirements. The RiteGroup websites contain material which is owned by or licensed to us. This material includes, but is not limited to, the design, layout, look, appearance and graphics. Reproduction is prohibited other than in accordance with the copyright notice, which forms part of these terms and conditions. All trade marks reproduced in the RiteGroup websites which are not the property of, or licensed to, the operator are acknowledged on the RiteGroup websites. Unauthorised use of the RiteGroup websites may give rise to a claim for damages and/or be a criminal offence. From time to time the RiteGroup websites may also include links to other websites. These links are provided for your convenience to provide further information. They do not signify that we endorse the other website(s). We have no responsibility for the content of the linked website(s). Your use of the RiteGroup websites and any dispute arising out of such use of the RiteGroup websites is subject to the laws of England, Scotland and Wales. The information contained in the RiteGroup websites is for general information purposes only. The information is provided by The RiteGroup and while we endeavour to keep the information up to date and correct, we make no representations or warranties of any kind, express or implied, about the completeness, accuracy, reliability, suitability or availability with respect to the the RiteGroup websites or the information, products, services, or related graphics contained on the the RiteGroup websites for any purpose. Any reliance you place on such information is therefore strictly at your own risk. In no event will we be liable for any loss or damage including without limitation, indirect or consequential loss or damage, or any loss or damage whatsoever arising from loss of data or profits arising out of, or in connection with, the use of the RiteGroup websites. Through the RiteGroup websites you are able to link to other websites which are not under the control of The RiteGroup. We have no control over the nature, content and availability of those sites. The inclusion of any links does not necessarily imply a recommendation or endorse the views expressed within them. Every effort is made to keep the the RiteGroup websites up and running smoothly. However, The RiteGroup takes no responsibility for, and will not be liable for, the RiteGroup websites being temporarily unavailable due to technical issues beyond our control. The RiteGroup websites and their content is copyright of The RiteGroup - © The RiteGroup 2013. All rights reserved. you may copy the content to individual third parties for their personal use, but only if you acknowledge the the RiteGroup websites as the source of the material. The RiteGroup is committed to ensuring that your privacy is protected. Should we ask you to provide certain information by which you can be identified when using the RiteGroup websites, then you can be assured that it will only be used in accordance with this privacy statement. The RiteGroup may change this policy from time to time by updating this page. You should check this page from time to time to ensure that you are happy with any changes. We may use the information to improve our products and services and to personalize your website experience. From time to time, we may also use your information to contact you for market research purposes. We may contact you by email, phone, fax or mail. We may use the information to customise the RiteGroup websites according to your interests. We use traffic log cookies to identify which pages are being used. This helps us analyse data about webpage traffic and improve our website(s) in order to tailor it to customer needs. We only use this information for statistical analysis purposes and then the data is removed from the system. The RiteGroup websites may contain links to other websites of interest. However, once you have used these links to leave our site, you should note that we do not have any control over that other website. Therefore, we cannot be responsible for the protection and privacy of any information which you provide whilst visiting such sites and such sites are not governed by this privacy statement. You should exercise caution and look at the privacy statement applicable to the website in question.